Born two days before a Christmas of 1992, Mbwana #Samatta becomes the first East African to win the African Player of the Year Award for players based in Africa. Samatta who had humble beginnings from African Lyon and moved Simba Sports before joining his current club TP #Mazembe emerged the winner with 127 points, ahead of his teammate and DR Congo goalkeeper Robert Muteba Kidiaba, who got 88 points. The 3rd place was taken by Algerian Baghdad who got 63 posts. 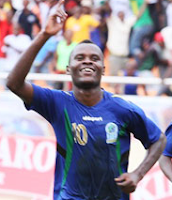 Samatta proved his worth in the TP Mazembe’s march to crown CAF Champions League (African Version of the #UEFA Champions League) by scoring six goals in the tournament. Back in his Country, Samatta has helped his National team, the Taifa Stars beat Malawi in the 2018 FIFA World Cup preliminaries, scoring one of the two goals that took Tanzania to the next step. African Player of the Year Award Gala was well decorated by the entertainment from Africa’s best artists including Salif Keita, Awilo Longomba, Shatta Wale, King Sunny Ade, Korede Bello, Flavour, Omawumi and Bez. The whole event was made possible by #Globacom.